Classical Opera's complete Mozart cycle continues by mining another rare gem in the young composer's output. 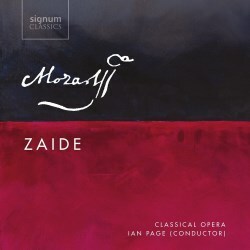 Mozart began Zaide in 1779 while living in Salzburg, intending to use it to pitch his talents to the Emperor in Vienna who had just created a new German opera company. In the end, circumstances intervened so that he never finished it, and he set it aside for good when he realised there was no prospect of a performance. Interestingly, however, the plot bears a lot of similarities to the opera that Mozart eventually did compose for Josef II's German Opera: Die Entführung aus dem Serail. Only fifteen musical numbers exist, and it doesn't tend to be successful in stage realisations, not least because the ending is left hanging, so a recording appears to be the best way to experience it, and this one is a good addition to Classical Opera's series. As with other barely known pieces like Die Schuldigkeit des Ersten Gebots or Apollo et Hyacinthus, Ian Page shows that he believes in this music by giving it a performance of rare distinction, bringing out all the fizz of the music and repeatedly revealing that this is a composer on his way to greatness, not just filling time in the provinces. With one exception, the young cast are on very good form. Allan Clayton is fantastic as Gomatz, the slave who falls for the Sultan's concubine, Zaide. His first aria, Rase Shicksal, zips along, full of passion and vigour, and he is just as convincing a lover in the ensembles, bringing lots of colour to his part. Stuart Jackson, the other tenor, gives him competition, however, as a hugely exciting Sultan Soliman, the wrathful villain who goes after the fleeing lovers. He throws himself into his Melodrama and arias in a most appealing way, and it helps that Mozart gives him such exciting music to accompany his railings. His second aria is much more restrained than the first, and Jackson makes the most of the character, making him seem more sympathetic than many would. Bass Darren Jeffery gets just one aria as the Sultan's servant Osmin, but he's much more benevolent than his namesake in Entführung, and Jeffery sings the aria with the right balance of humour and lyricism. The only major weakness is Sophie Bevan, who just doesn't sound herself in the title role. The voice is still sweet and attractive, but she sounds stretched through the higher-lying sections of the famous Ruhe Sanft, with a touch of paleness in those passages. Unfortunately, that trait reappears in her later arias – she sounds really very uncomfortable in some of the quick passages – and in the ensembles too, and it's only in the (slightly lower-lying) trio O selige Wonne that she sounds fully comfortable with the part. Oddly, the same is true for the normally reliable Jacques Imbrailo, who sounds a little off colour in his first aria. He's the harem guard who dreams of a better life and so plans escape with the lovers, but his usually warm and lyrical baritone here sounds a little gruff and uncomfortable though, thankfully, he seems back to his normal self by the time of his last aria. If ultimately this is a mixed bag for the singers, then unarguably the most consistently rewarding musical stars are the orchestra, who live up to the extremely high standards they've set in previous recordings. There is energy, fizz and juice aplenty, as well as rewarding lyricism in many of the slower moments, and the whole is captured beautifully in the excellent acoustic of St Augustine's, Kilburn. Mozart didn’t get as far as writing an overture, and Ian Page’s choice of an Entr'Acte from Mozart’s music for Thamos, King of Egypt, is inspired, sounding strident, urgent and vigorous, with a real sit-up-and-take-notice quality to it that kicks the whole thing off brilliantly.